Hosted by HCET, the 6th Annual Summit will be held on October 17-18 in Green Lake, WI. Please register today! This conference will feature presentations from NCSD’s David C. Harvey and Sara Stahlberg. In August 2018, the Centers for Disease Control and Prevention reported that STD rates hit a record high the previous year. Approximately 2.3 million cases of chlamydia, gonorrhea, and syphilis were diagnosed in 2017 – an increase of more than 200,000 cases compared to 2016. Staying on top of current trends in STD and HIV prevention and intervention is essential to best practice. With STD rates on the rise, our communication around behaviors and risk greatly impacts the frequency of STD screening. 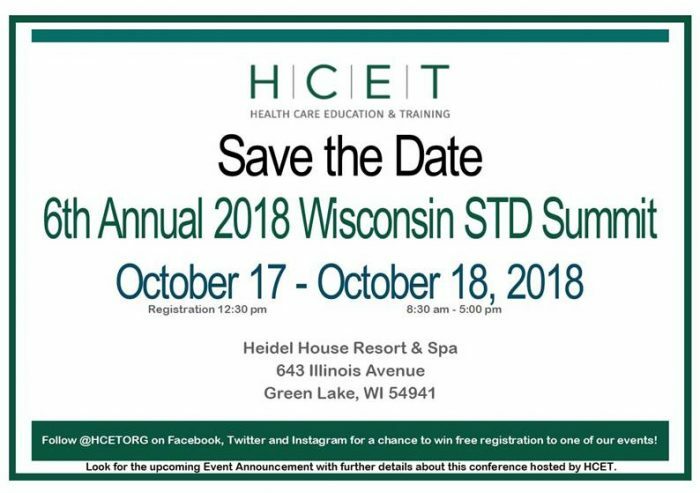 The Wisconsin STD Summit wants to increase knowledge around epidemiology, research, prevention, and treatment of sexually transmitted diseases using a public health perspective. After attending the Wisconsin STD Summit, participants will be able to identify a variety of strategies for creating inclusive, non-shaming narratives around STD prevention, testing, and treatment. This year’s Wisconsin STD Summit kicks off Wednesday, October 17, 2018, with on-site registration beginning at 12:30pm and our first plenary session at 1:00p with Dr. Bradley P. Stoner, Medical Director and Associate Professor of Anthropology & Medicine at St. Louis STD/HIV Prevention Training Center, Washington University in St. Louis. The Summit will conclude on Thursday, October 18, with closing plenary speaker David C. Harvey, MSW, Executive Director of the National Coalition of STD Directors (NCSD).